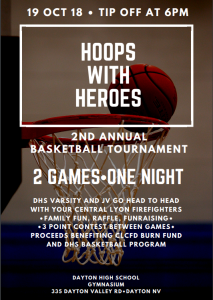 Dayton High School Varsity and JV go head-to-head with your Central Lyon Firefighters. There’s a 3-point contest between games. This family fun event includes a raffle and is a fundraising opportunity for the school and the Central Lyon County Fire Department Burn Fund.